Shamans Through Time - ARTE AMAZONIA provides a global voice through art for the indigenous cultures of the Amazon. 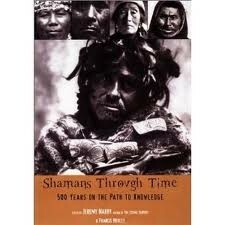 Shamans Through Time written by Jeremy Narby and Francis Huxley, is perhaps one of the most important works on shamanism exploring the last 500 of years of Western perceptions of indigenous practices which they have attempted to label, categorize and interpret. The book is comprised of a series of essays from personal accounts recorded by priests, explorers, doctors, including some of the most prestigious anthropologists, on what they observed from what appears rather strange shamanistic behaviors and rituals in cultures from around the world. Highlighted are the numerous practices used by shamans to achieve altered states of consciousness to access information in attempt to heal and influence their communities. Moreover, this collection of works traces Western civilizations struggle to interpret and understand these ancient knowledge systems and in doing so reflecting our own developments in historical cultural thinking rather than only a documentation of shamanism. This collection of historical essays, encourage us to challenge or own thinking systems, essentially highlighting how we relate to 'the other'. It reveals that perception itself is transformative exposing the values we often impose on other belief systems. Reflecting on the westerners encounter with the shamans' mystical experience suggests the importance of an open mind in the path to authentic knowledge.